Focus Groups, Side Hustles, Spend It! It’s never too early to start saving money for Christmas! I know that people tend to not plan ahead or rush out to use lay away to buy junk presents. So I am challenging my SophisticatedSpendologists to start planning today! I want my readers to Save Money ($500) by Christmas (or Black Friday, or Small Business Saturday). 1. Redirect Spending: Pick a category from September and decide to save that amount in October, November AND December. You can pick any one you want: Gas, Utilities, Cellphone, Cable, Coffee, Restaurants-you get the idea! Spend 5 or 10 minutes packing up tonight’s leftovers for work tomorrow. Or head to the grocery store and buy a quick bag of salad mix, lunch meat (or tuna), bread and some chips and you can get by pretty cheap for the week! I usually cook a lot on Sunday night and take that for lunch at least Monday-Wednesday. 3. Go to Happy Hour: Yes, I said that right. If you tend to splurge on lunch or dinner during or after work, you can potentially save lots of money at happy hour. Drinks and food are normally half priced. I can grab a drink and eat a very good meal at my favorite two DC Happy Hour spots for well under $10. 4. Do the Math: There are 65 days till Christmas. You will need to only save around $8 a day to reach $500 by then. Also, there are 37 days till Black Friday, so you will need to save around $14 a day to reach $500 if you plan to do all of your shopping on Black Friday (and don’t forget about Small Business Saturday). OK, so this post is a little late. But at least you know where your numbers are! 5. Challenge a Friend: Share your goal of saving with a friend and come up with other ways to save money. You can both hold each other accountable for your actions and have fun being on the same page with your money goals for the rest of the year! Bonus: Side Hustle: Check out my post on getting into Focus groups! Find Focus Groups and Mystery Shopping opportunities in your areas! Do some dog sitting or baby sitting or cleaning for others. I think for my challenge I will pick option #3 (of course). I LOVE happy hour. I will also pick #1 and figure out how much money I spent on gas last month and try to save that amount for the next 3 months. Pay for the things you already bought (if you have credit card debt). I’d rather you gift fresh baked cookies or mini-cakes instead of stuff (AKA Clutter). Baking is waaay more fun than standing in long lines and you don’t have to stress about the person not liking your gift. Just be honest with your friends and family! You’d be surprised, they may be thinking the exact same thing! 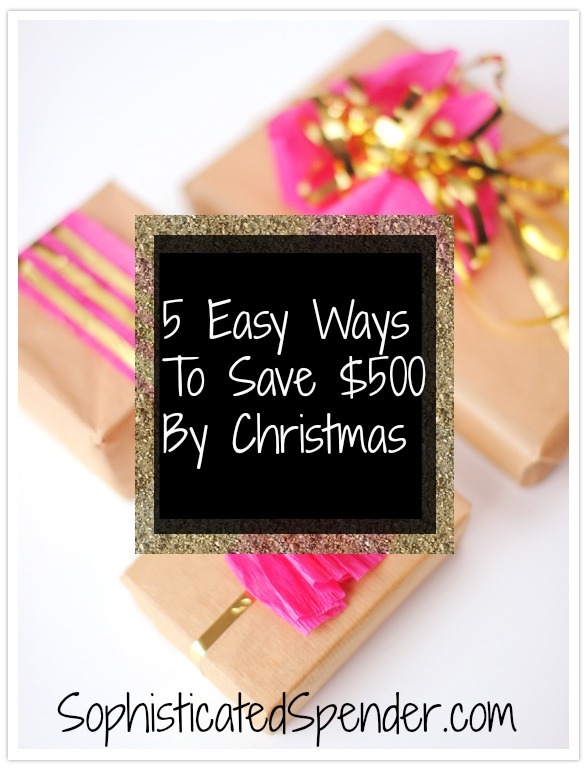 Or check out this Free 30 Day Christmas Gift Buying Hack. Can you think of any other ways to save? I’d love to hear your ideas in the comments below! I love happy hour-it’s really popular in Denver (so is brunch). Is it not as popular in D.C.? Happy hour is VERY popular here! I can’t live without happy hour at all. Brunch is also popular but a LOT more expensive than happy hour! I actually held a brunch cooking class with my neighbors one morning. I was super cool! And very inexpensive! When you break down the amount to save per day, it sounds simple! See, it really doesn’t seem like a lot of sacrifice at all! Thanks for sharing Shirria!